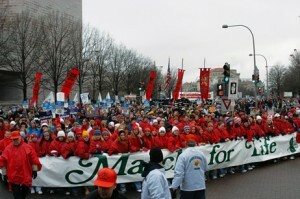 The March for Life in our nation’s capital began on January 22, 1974 and marked the first anniversary of Roe v. Wade. That first March for Life rallied around 20,000 people on the west steps of the U.S. Capitol Building. An estimated 225,000 marched on the 25th anniversary in 1998, and last year on the 40thanniversary it was estimated that over a half million people gathered in the National Mall to show their opposition to the murder of the most innocent of the human family — the preborn child. There are just laws and there are unjust laws. I would agree with St. Augustine that an unjust law is no law at all … One who breaks an unjust law must do it openly, lovingly … I submit that an individual who breaks a law that conscience tells him is unjust, and willingly accepts the penalty by staying in jail to arouse the conscience of the community over its injustice, is in reality expressing the very highest respect for law. As we gather around the nation to denounce the unjust and immoral decision ofRoe v. Wade, I pray that we have the courage to persevere in our quest for life, liberty and the pursuit of happiness for every human life.